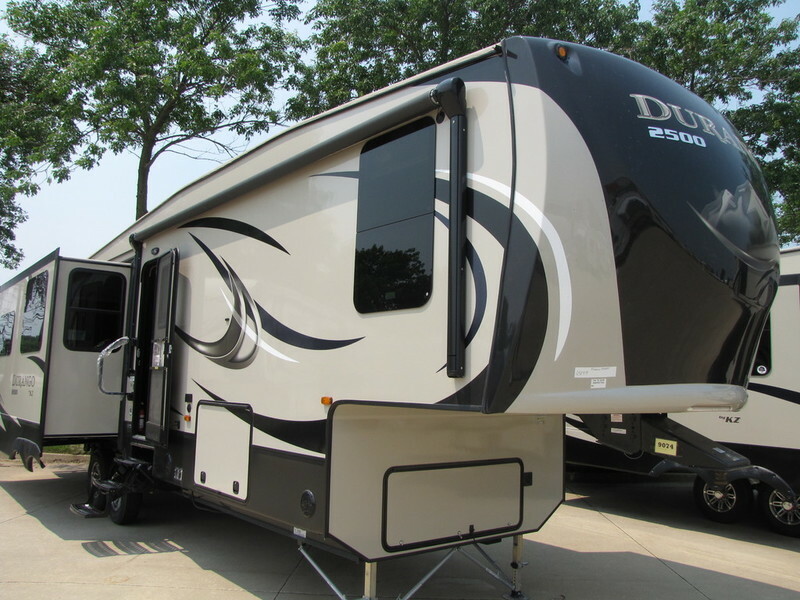 The 2011 Durango 275RL Fifth Wheel by KZ with a UVW of 7,300 Lbs and sleeps up to 4 is ideal for the couple interested in a lightweight fifth wheel. 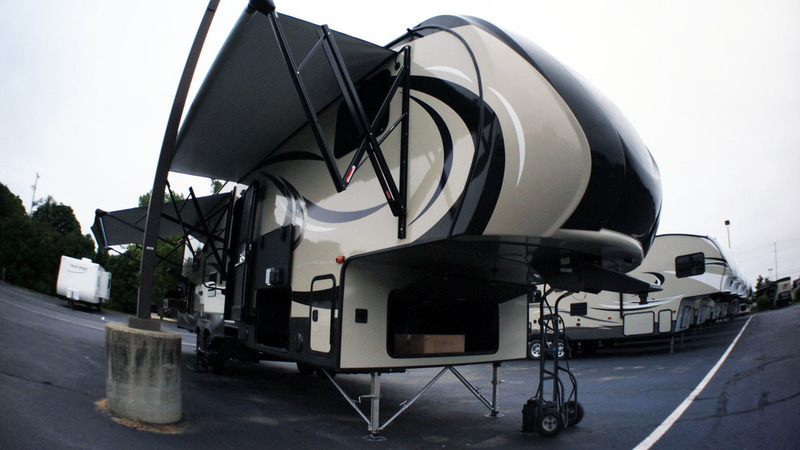 The 275 RL has a 18' Power Awning, Enclosed Underbelly, Outside Shower, Aluminum Wheels, Ladder, Two 30 Lb Propane Tanks, Black Tank Flush, Power Front Jacks, 2 Rear Scissor Stabilizer Jacks and a 6 G G/E DSI Water Heater. 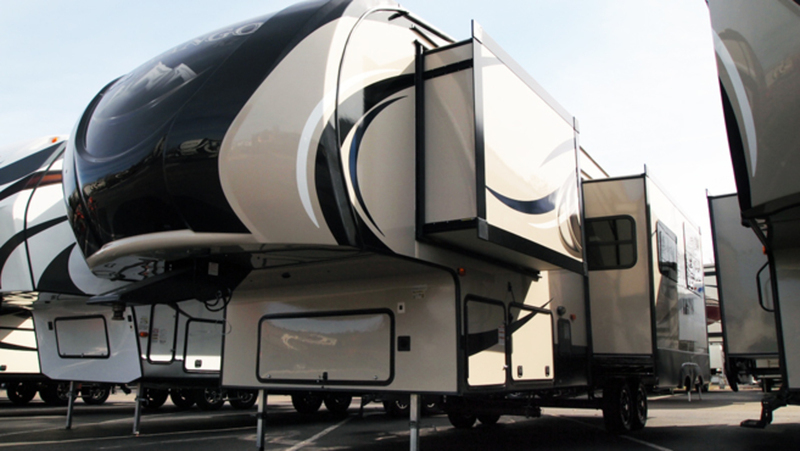 On the inside of the spacious 275 RL there are 2 Swivel Recliners, Hide-a-Bed Air Bed Sofa, and Table w/Leaf and 4 Chairs. There is ample cabinet space in the kitchen as well as an 8 Cubic Foot Refrigerator, 3 Burner Gas Stove w/Oven, Microwave, and Pecan Decor throughout. There is a Wardrobe Closet Slide in the master bedroom, and a TV Bracket. In the bathroom there is a Sink, Vanity w/Mirrors, Porcelain Toilet and a Shower w/Glass Enclosure. 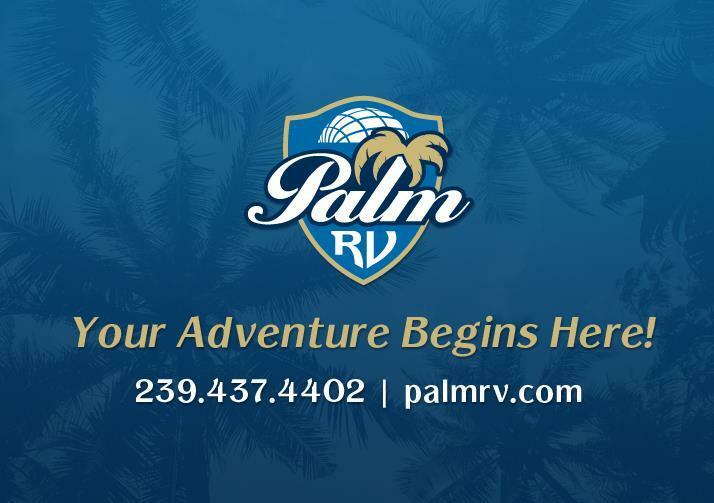 For more information call today! 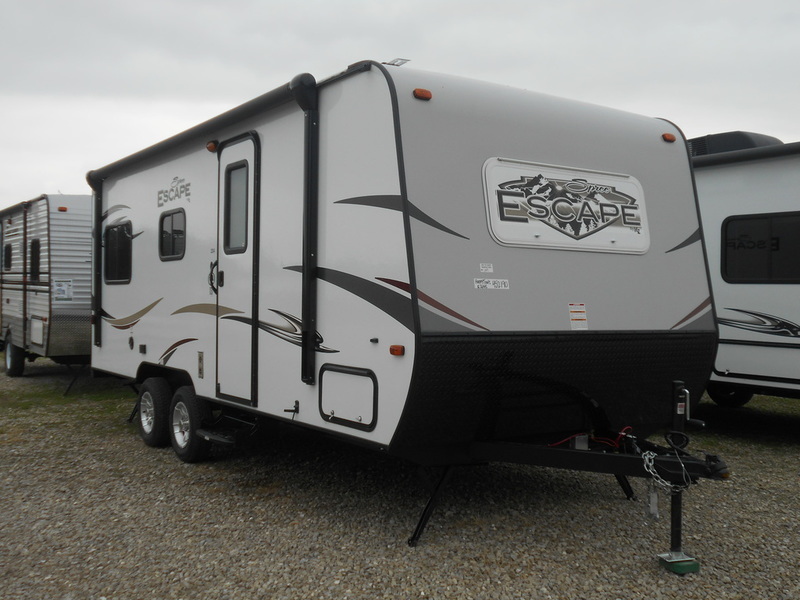 2016 KZ RV Escape E204S, 2016 KZ RV Spree Escape E204S The K-Z Spree Escape offers you the perfect way to enjoy your own weekend escape. Spree Escape offers a very lightweight travel trailer that features sleeping for seven people. From the elegance of the décor down to the splendid choice of the wood look floor, you will be proud to have friends and family visit you in your new trailer. The Escape has all of the essentials, along with a touch of luxury and comes packed with extras like AM/FM/MP3/i-Pod Radio, tinted windows, A/C, stabilizer jacks, spare tire, awning, and a diamond plated rock guard. With its lightweight design this can even be towed with a mini-van, making this a great trailer for those weekend get-a-ways. 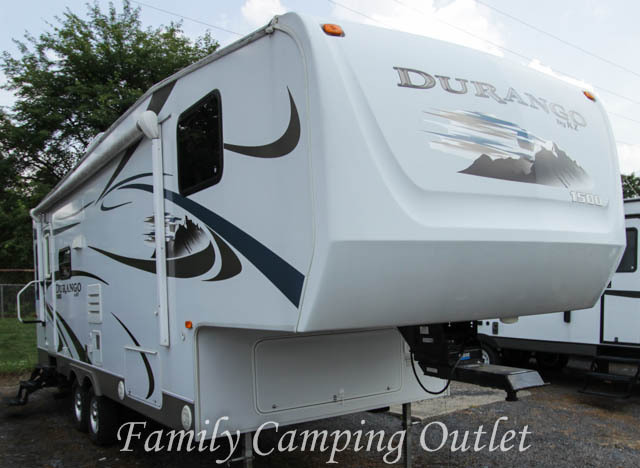 2016 KZ RV Durango 2500 D336RET, Standard Equipment One-Piece Aerodynamic High Goss Fiberglass Front Cap Stabilizer Jacks Awning with Drip Rail & Spouts Microwave with Turn Table 13,500 BTU Ducted A/C Enclosed Pin Box Security Light 12 Gal. Gas/Electric DSI Water Heater Skylight Over Tub Pillows for Sofa Wire for Satellite Heated Tanks & Enclosed Underbelly Tinted Safety Glass Windows Black Tank Flush System Power Jacks 6 Cu Ft Refrigerator w/Raised Panel Wood Insert (Durango 1500 Only) 8 Cu Ft Refrigerator w/Raised Panel Wood Insert (Optional on Durango 1500) 32” LCD TV Assist Grab Handle, Night Shades AM/FM/CD/DVD Player w/USB Port Porcelain Toilet, Outside Speakers Innerspring Mattress Roller Ball Bearing Drawer Guides Dexter Nev-R-Adjust Brakes Gas Struts on Bed Base Outside Shower Solid Surface Countertops Decorative Light Above Dinette Screwless Exterior Moulding Easy Read Command Center Bus Style Slam Latch Baggage Doors Hide-A-Bed (Optional on Durango 1500, forced on D326RE) Bedroom Slide (N/A on D275RE & D296BH) Optional on D245SB, D275RL & D2857) 16” tires (15” on D285RL, D315RE, and all Durango 1500 floorplans) Spare Tire/Carrier /Cover (Optional on Durango 1500) Drop Bi-Level Frame (N/A on Durango 1500) Wire for A/C in Bedroom (N/A on Durango (1500) Ceiling Fan (N/A on Durango 1500) 2 Halogen Lights Above Sofa (N/A on Durango 1500) All Weather Upgraded Insulation Package Electric Fireplace 4 Pt. Automatic Leveling System w/JT Strong 2nd 13,500 BTU A/C in Bedroom Low Profile Cotton Cloud Gel Top Foam Mattress Free Standing Table w/Leaf and 4 Chairs 5 Function Remote Flip Up Bike Rack/Cargo Tray 2016 KZ RV Durango 2500 D315RKD The Durango 2500 was created for the experienced RV’er who wants all the necessities in an RV and more. Durango 2500 units feature a master bedroom slide-out, solid wood raised panel cabinet doors, and solid surface countertops. 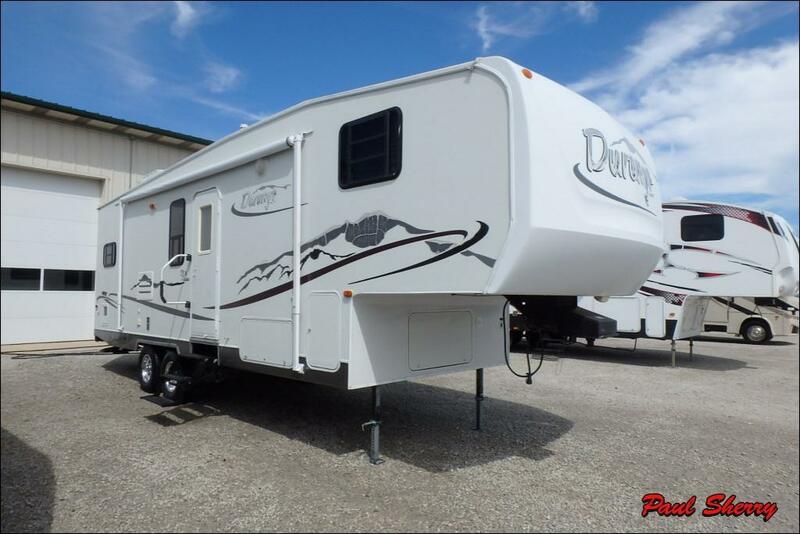 2016 KZ RV Durango 1500 D286BHD, 4 POINT LEVELINGFIVE FUNCTION REMOTECOTTON CLOUD GEL FOAM MATTRESS UPGRADEFIREPLACE (N/A D275RL)FLIP UP BIKE RACK/CARGO TRAYALL WEATHER UPGRADED INSULATOIN PACKAGEREESE REVOLUTION HITCHRVIATABLE AND CHAIRS WITH LEAFTHEATER SEATING (N/A D295CS)(FORCED 281RLT) 2016 KZ RV Durango 1500 D286BHD The Durango 1500 is a true half-ton towable fifth wheel with all the luxury appointments of a much larger RV. The visual appeal of raised panel glazed cabinetry and three designer inspired interior decors is key to the Durango 1500’s attractive interior. 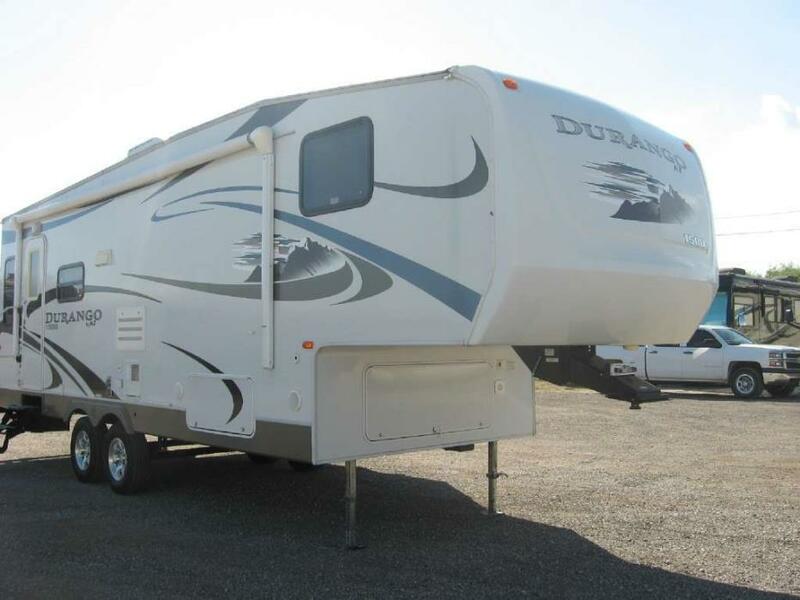 2015 KZ RV Durango D336RE, Standard Equipment One-Piece Aerodynamic High Goss Fiberglass Front Cap Stabilizer Jacks Awning with Drip Rail & Spouts Microwave with Turn Table 13,500 BTU Ducted A/C Enclosed Pin Box Security Light 12 Gal. Gas/Electric DSI Water Heater Skylight Over Tub Pillows for Sofa Wire for Satellite Heated Tanks & Enclosed Underbelly Tinted Safety Glass Windows Black Tank Flush System Power Jacks 6 Cu Ft Refrigerator w/Raised Panel Wood Insert (Durango 1500 Only) 8 Cu Ft Refrigerator w/Raised Panel Wood Insert (Optional on Durango 1500) 32 LCD TV Assist Grab Handle, Night Shades AM/FM/CD/DVD Player w/USB Port Porcelain Toilet, Outside Speakers Innerspring Mattress Roller Ball Bearing Drawer Guides Dexter Nev-R-Adjust Brakes Gas Struts on Bed Base Outside Shower Solid Surface Countertops Decorative Light Above Dinette Screwless Exterior Moulding Easy Read Command Center Bus Style Slam Latch Baggage Doors Hide-A-Bed (Optional on Durango 1500, forced on D326RE) Bedroom Slide (N/A on D275RE & D296BH) Optional on D245SB, D275RL & D2857) 16 tires (15 on D285RL, D315RE, and all Durango 1500 floorplans) Spare Tire/Carrier /Cover (Optional on Durango 1500) Drop Bi-Level Frame (N/A on Durango 1500) Wire for A/C in Bedroom (N/A on Durango (1500) Ceiling Fan (N/A on Durango 1500) 2 Halogen Lights Above Sofa (N/A on Durango 1500) Luxury Package Aluminum Wheels w/16 Tires EZ Flex Heavy Duty Rubber Suspension Ladder 15,000 BTU A/C Wire for 2nd A/C in Bedroom 50 Amp Service 12 Gal. Gas/Electric DSI Water Heater Power awning Fan-Tastic Fan w/remote Innerspring Mattress Table & 4 Chairs w/leaf Frameless Windows, Sandlewood Edition, Painted Front Cap Glass Shower Door, 2nd 13,500 BTU A/C in Bedroom Cotton Cloud Mattress Upgrade, Recliner(s), Fireplace Power Rear Jacks, 12V LED Lighting Package Bedroom TV 19 2015 KZ RV Durango D336RE The Durango was created for the experienced RVer who wants all the necessities in an RV and more. Durango units feature a master bedroom slide-out, solid wood raised panel cabinet doors, and solid surface countertops. 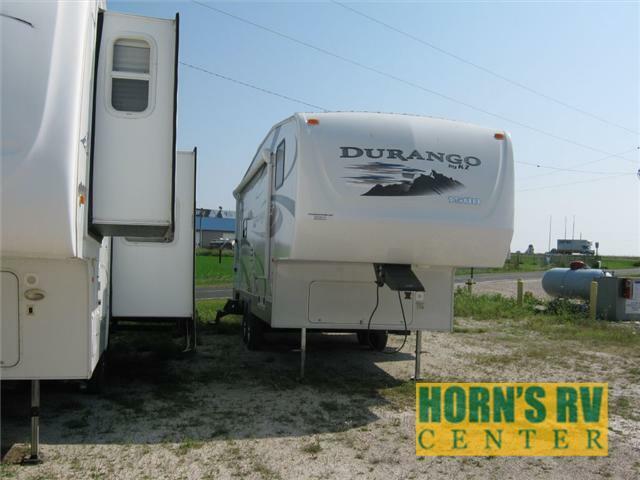 The Durango is available in 7 floorplans that range in length from 33' 10" to 40' 2".